The care packages are being sent to active duty military stationed in the Middle East. 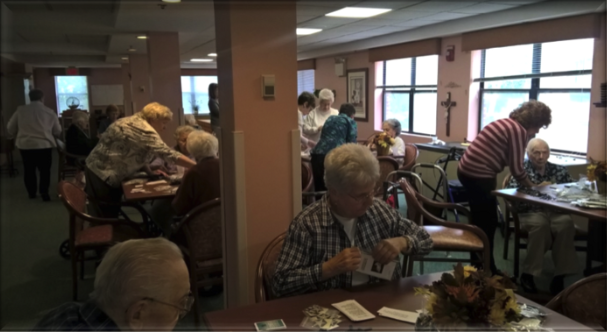 On Nov. 3, residents of St. Mary’s Villa in Cherry Hill and volunteers from Church of the Holy Family in Washington Township partnered to assemble spiritual care packages destined for active duty military in the Middle East on the cusp of Veterans Day. Nearly 20 gathered together to learn about the handcrafted rosaries and hand embroidered stars that had flown over American soil and were assembled by ministry volunteers. They are now being gently packaged with individual instructions, prayers and novenas to the service people, reminding them of their gallant efforts keeping our society free and with the strong hope for their safe return away from combat zones. This initiative helps everyone heighten their awareness and sensitivity that military is still in high-risk areas trying to keep the peace. Service people or chaplains will receive and distribute these packages and know much compassion and care was put into their creation to symbolize how important a role they have in our society. Organizer Mary Burns was so delighted to find this group who feels has just the perfect combination of Catholic-focused spirituality and many patriotic volunteers including John who saw much wartime action. She was inspired to initiate the spiritual care package program, since her son is a 20-year Navy careerist and she wanted him to feel protected even being deployed. She started creating prayer squares that were a part of prayer shawls, yet simplified the item to a prayer square with special knots representing all the prayers that could be more easily shipped and transported during deployments. Burns found a knitting and crochet club from the local library and coordinated packing and shipping the special contents with the Military Support Group of NJ locally run by Karen Jennings. This has since morphed into the handmade rosaries and embroidered stars also being components of the ministry, to engage parishioners in meaningful activities and combined with St. Mary’s senior residents this season. It was a combination for a superb meaning. St. Mary’s residents were proud to be a part of this special initiative. Some of the retired nuns were thrilled to interact with former family members of students they had taught and had a heightened sense of camaraderie. Earlier in the day, one of the sisters was unsure if she would have the physical strength to participate, but she and others did and were so glad to make a difference to help the military realize we are praying for them from afar. Sr. Hartnett commented she wanted to know when the ministry was returning, so they could continue to work together and do special things for the greater good.